Learning how to use a syringe pump for the first time? No worries. Here are a few things you need to know about how infusion pumps work in the lab—and the important parts of your Chemyx syringe pump that you will need to know to get started. What is a laboratory syringe pump? A syringe pump is a small positive displacement pump used to gradually dose precise amounts of fluid for use in chemical and biomedical research. Why use a laboratory syringe pump? Syringe pump systems offer multiple orders of magnitude, better precision, and much better accuracy than their medical syringe pump counterparts. In addition, Chemyx syringe pumps have no pulsation, compared to peristaltic or piston pumps, which ensures a continuous flow. How low can flow and volume delivery go? 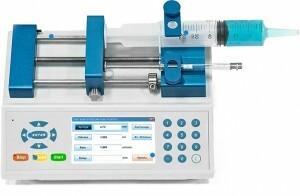 Nanoliter flow rates and volumetric accuracy are easily achievable with any Chemyx syringe pump. Pusher Block: contacts the plunger, initiating flow. Syringe Clamps: hold syringes in place during operation. Release Nut: allows manual positioning of syringe pusher block. Interface: lets you to easily program in flow rates and volumes—with programming that allows you lookup syringe sizes and schedule delay times.